For Refrigeration and Air-Conditioning (RAC) apprentice Lucas Rankin, moving from Samoa to New Zealand five years ago has set him on the career path he’s always wanted. “My family are really proud of what I’ve achieved so far. They want me to complete my apprenticeship as soon as I can, so I can go back home to Samoa and start a business,” Lucas says. But completing his apprenticeship with Excel Refrigeration and Air Con Ltd is his main priority. 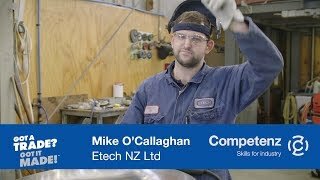 Before starting his apprenticeship in December last year, Lucas did a pre-trade course at Manukau Institute of Technology (MIT) through the Auckland Māori and Pasifika Trades Training scheme. After his first three months at Excel, Lucas was offered an apprenticeship. “Every week I work with a different technician on whatever job they’re doing. It’s great seeing how other people work. I learn a lot from them,” he says. Lucas enjoys the variety offered every day at Excel. The team at Excel have been supportive of Lucas throughout his training. “Lucas fits in really well with the team. He’s an extremely keen worker and has come a long way in his training. He will make a great technician once he’s qualified,” says Excel Auckland Manager Jason Roud. Lucas wants to continue to build his career in the RAC industry. His advice to young people thinking of doing an apprenticeship?